I have had a job since I was 14. I waited tables at Peter’s Little Bavaria shortly after I was old enough to get a worker’s permit. I was in a grocery workers’ union by the time I was 16. Before I turned 20, I had worked in landscaping, food service, grocery, mechanics and child care. Getting a job was never a problem for me. Getting ahead was. Just about 18 years ago, I convinced my best friend to marry me. She might have believed that I’d one day be wealthy, and that I’d take her around the world with me. I’m not sure where she got that idea. We followed some good advice and spent our first year together living at my parents’ home. We saved a little money and tried to figure out how much we’d cost together. There were times when we made good money and when our expenses were low. And there were times when accidents occurred and unexpected medical expenses drained our savings. Some call these the ups and downs of life. At some point, whether we were ready for it of not, we had a child. This was not as a result of poor planning. In fact, for many years, it was the folks at Planned Parenthood that helped us afford to use birth control. To my dear friends who see everything in black and white, contraception and abortion are only parts of what Planned Parenthood does. Defunding anything without thinking through the ramifications may just prove more costly than you might think. Shortly after we conceived, we found ourselves at the receiving end of another of life’s beatings. The upside was a little money left to us by my grandfather. Enough, in fact, for me to start a small house painting business. I bought a van, a sprayer, a few buckets, some sandpaper and my contractor license. The downside was an accident that nearly blew off my left index finger. Four surgeries later, I got to keep the finger, but I lost my business. I sold off the van, the sprayer, the buckets and the sandpaper to pay for some of the medical bills and the medications I needed for an experimental plastic surgery that allowed me to keep my finger intact. The total medical bill amounted to more than $20,000, if memory serves. The doctor told me I could cut that in half if I decided to let the finger go. Here’s the kicker though. My wife and I were on the Oregon Health Plan at the time. As a young married couple with very low income, we qualified for at least basic medical care. After many months of therapy, I was able to work again. But we were broke with no way of borrowing enough to start up the business again. So we went back to volunteering at a non-profit missionary organization we had been affiliated with several years before. My wife was 5 months pregnant when we left to live on a little, impoverished commune in one of the richest valleys on the island of Oahu. Yes, it was Hawaii, but the first night we slept in our room in a shack at the back of the mission’s property, we woke up to rats in our bed. Impoverished doesn’t even begin to describe us at this point. We were volunteers. We prepared our own food, fixed our broken pipes, trimmed our trees and worked together as a community so we could serve the larger community around us. Given the choice of looking for low-income work or volunteering at a mission to try to do some good in this world, I think it’s obvious why we did what we did. Living in such conditions, we qualified for the Hawaii state health plan. When our first child arrived, we welcomed him into this world with grateful hearts for the services we were receiving, for the goodness of the citizens of Hawaii to take care of their lowest income residents in this way. Several years went by. We rode the ups and downs of life. I decided to go to college, since the options for work were very limited. No income means no credit, no credit means no small business. When my wife and I decided we wanted to have another baby, it was in a season of stability. The coast looked clear, the horizon was unclouded. But even as a bar man making good tips, we never reached a point of comfort. Abject poverty was always just two missed paychecks away. We understood this. It’s part of the fear that keeps you trapped in the same cycle for years and years. The government carried us thorough many tough days, especially those scary days when your child is sick or needs emergency care and you have no idea how deep those costs might run. WIC provided milk, tuna, cheese and cereal for all three of our children. It wasn’t that we couldn’t afford those items. It was that with the help, We were able to establish another small savings account. Maybe a two-month buffer between abject poverty. Just enough, perhaps, to make the decision to go to college instead of looking for another low-wage job. 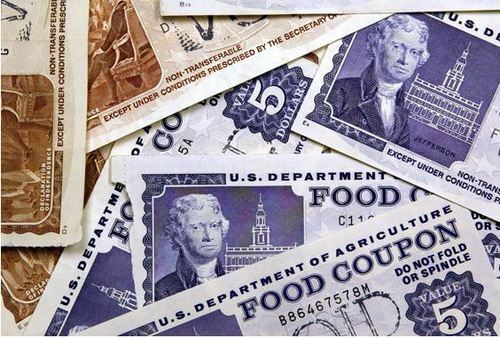 Hearing members of my family talk about the ne’er-do-wells on food stamps still stings a little. That’s because at one point, my wife and I qualified for food stamps on the federal level. But a state law kept us from receiving that aid. I kept the card around as a souvenir for many years. Mostly to remind myself that I needed help not once, not twice, but many times. There were times when we went to the food bank provided by a local church. At other times, we picked up carrots and onions at the farmers market with a small check from the U.S. government. At times, we relied on the goodness of our neighbors for food and sometimes for shelter. While in college, we lived off my wife’s income and the residual from grants provided for books and technology needs. We lived in a double-wide trailer. There were nights when I slept on the couch with a pellet gun by my side so I could shoot the rats that would come up from holes in the floor. I remember making meals with whatever we had in our pantry. But our babies ate well and drank their milk and grew into healthy children. And I graduated from college having paid for half my education out of pocket. I still owe $32,000 to the government for the remainder of my student loans, but that is the best debt I will ever have. In the months after college, we crawled very slowly out of the depths of abject poverty into more comfortable realms. We did not achieve this because of high wages. I was, after all, a journalist. We achieved this because of those circumstances in life that you can never count on but which make your life either unimaginably easier or horrifyingly terrible. Nearly blowing my finger off with a paint sprayer was a variable. Losing a job because of a near-death car accident was a variable. So was the offer of living in my wife’s grandmother’s house so it would not fall into disrepair after she went to hospice care. So was the use of my parents’ cars so I could work. Today I make more than twice what I made when I took my first job in journalism. If I earned these wages 20 years ago, I would have been considered upper middle class. And still, we are only a few paychecks from abject poverty. The goal of having six-months worth of savings remains a distant dream. The money we have saved at times has been used up when we needed to make a deposit on a rental house, pay off an unplanned trip to the emergency room or take care of those other debts that tend to show up when you’re not looking for them. I still rely on the government for help at times, like when I was laid off from the Missoulian newspaper a couple of years ago. Just three years ago I bought my first house with a $10,000 tax credit that the government was giving out to encourage first-time home buyers. I don’t know if I’ll ever need to go on food stamps or if I’ll have to rely on the government for health insurance. I suppose I expect to again, knowing full well that the ups in life generally mean you must go down. This is a lot more of my story than I like to tell people. It’s not that I’m ashamed, it’s that it’s a lot to tell, and we have short attention spans. The reason I wanted to write this today is for those of you who are quick to judge, and especially for those of you who tend to lump everyone into the same category. I do not deny that there are many people, thousands of people, in fact, who take advantage of government help. I have met many of them in the lines at the state and county health organizations and in the lines at the grocery store. I also know, from experience, how difficult it is to escape the cycle of poverty. I know that for every inch you crawl your way out of it, you are just a slip away, mere seconds, from the bottom. Was I lazy? No lazier than you. Let me finish where I began. I have had a job of one kind or another since I was 14. I have seen good times, and I, like many others, believe in the hard work it takes to achieve them. I have seen the fickle nature that life takes at times. I have made wrong turns. I have gone down the wrong path more than once. If you know me well, then you know my heart for people and the way I want to care for others. Now you know another part of my story. And I hope that before you publish another damning post on Facebook or Twitter that lumps us all in together as lazy ne’er-do-wells who rely on the government with no desire to make anything better of ourselves. You are speaking about my wife and I.